"Finding out Baylor had added a PhD program was a God-send. I could have the flexibility of an online program with the benefits of face-to-face interaction with teachers and other students all while incorporating my faith into my studies." 2. How long will it take to complete the doctoral program? 3. How does the online curriculum work? 4. When are students admitted to the program? 5. How many students are admitted into the program? 7. What kind of financial aid can I anticipate? 8. When should I submit my application? Yes. Students need to submit valid GRE scores as part of the application. Scores are valid for five years from the time the test is taken. Students should be able to finish the program in three to four years. The program is designed as a 10-semester curriculum and is taught primarily in an online classroom using synchronous, high-definition videoconferencing technology. 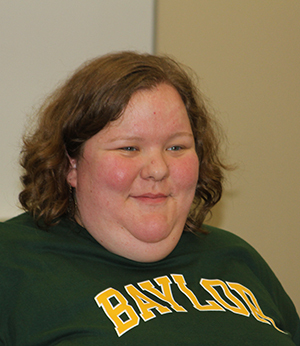 A new cohort of 5-7 students starts in odd-numbered years only and begins classes in the summer semester with a required four- to five-day session on the Baylor campus in Waco, Texas, before the summer session begins. Throughout the program students will attend all of their classes in an online classroom using videoconferencing technology. Each class meets at a specific time each week, and classes meet on Monday and/or Thursday evenings from 6:00 to 9:00 pm CST. Students must be present to be a part of the class. During synchronous class sessions, students see and talk with each other as well as the instructor in real time. Classes are conducted much as they would be on campus, except that students are able to be anywhere in the world. The PhD Admissions Committee will review applications completed by the following dates: August 1, 2018, November 1, 2018, and February 1, 2019. At each of these review sessions except the final one, the committee will decide to offer admission, deny admission, or let the application remain active until the next review session. Applications that remain active may be revised by the applicant (for example, submit a higher GRE score or a new writing sample) prior to a subsequent deadline. Financial aid decisions may not be finalized until after the November or February review session. Applicants will be notified if all available seats for the 2019 Cohort have been filled prior to the November or February review session. Five to seven students will be admitted into the program every other year (2017, 2019, etc.). Yes. The online curriculum provides the flexibility to allow students to continue working while enrolled in the program. Financial aid packages will be awarded based on the strength of the student's application and indicated need. Applications for the 2019 Cohort may be submitted by the following dates: August 1, 2018, November 1, 2018, and February 1, 2019. Applicants will be notified if all available seats for the 2019 Cohort have been filled prior to the November or February review session. There are four primary components to the cost of the program: tuition, fees, books/computer, and travel. 1) An estimate of the tuition can be calculated by multiplying the cost of tuition per credit hour see for tuition rates for 2017-18 by 60 credit hours (up to six hour may be taken at another university). This calculation will not include any increases in tuition during one's tenure in the program. 2) Since all courses are considered off campus, the only fee is a $100 per semester administrative fee. The standard program consists of nine semesters. 3) Students will need an up-to-date computer, video camera (usually built into a laptop computer), a headset, and hard-wired access to the Internet. A wireless connection is seldom reliable enough for sustained participation in the virtual classroom. Most semesters students will be enrolled in two classes that require one or more textbooks. 4) Students are required to be on campus for five days at the start of the first summer semester. Travel and hotel arrangements are the responsibility of the students. We expect to make arrangements with at least one hotel that will give students a modest Baylor discount.